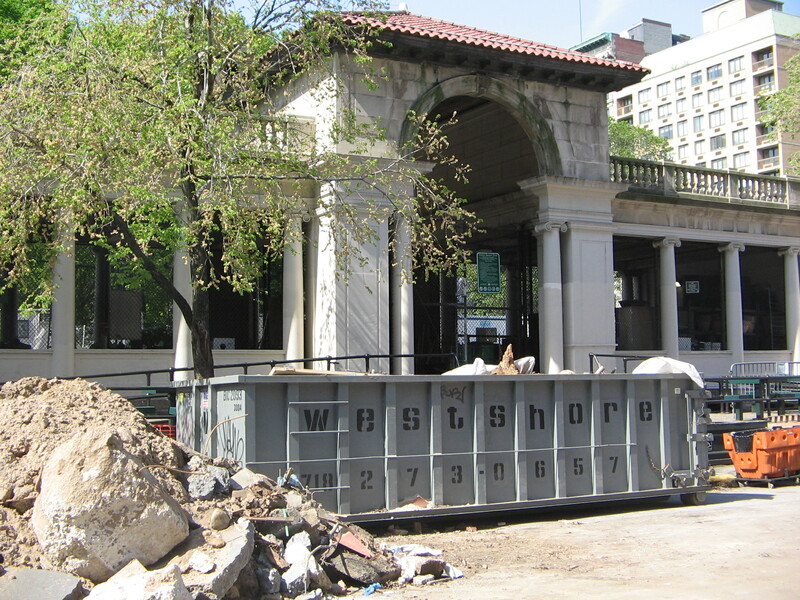 The City was forced to halt construction on the pavilion at Union Square Park. Photo: Jonathan Reingold. Judge issued a temporary restraining order, thwarting the City’s plan to install a restaurant in Union Square Park. In 2004, the City announced plans for a $14 million renovation of the entire north end of Union Square Park, with the Union Square Partnership contributing $6 million for the effort. Under the plan, the park’s pavilion would be renovated and used as a restaurant during the summer and portions of the spring and fall. Previously, the City allowed an area south of the pavilion to be used for a seasonal outdoor restaurant until the restaurant closed in 2007. The Parks Department has already begun work around the pavilion. Neighborhood residents filed an Article 78, arguing that the City was privatizing parkland without the required approval of the State Legislature in violation of the common law doctrine of public trust and State law. The residents also argued that the project is tantamount to an amendment to the zoning resolution and, as such, subject to the City’s land use review process. Lastly, the residents argued that the project negatively impacts parkland because it calls for the removal of 15 trees and the demolition of two playgrounds. The City argued that a seasonal restaurant in the pavilion does not require State approval, as it is well-established that restaurants in public parks are a proper park use. The City also stated that the project is not tantamount to a change in the zoning resolution because it does not change the layout, size, or structure of Union Square Park or the pavilion. Moreover, the project would add 53 trees to the park, to replace the 15 that are slated for removal. Further, although the project includes the demolition of two playgrounds, the City notes that it would, upon completion, triple the size of playground space in the park’s north end from 5,000 sq.ft. to 15,000 sq.ft. State Supreme Court Judge John E. H. Stackhouse granted a five-day temporary restraining order on April 21, 2008, prohibiting any construction activities relating to the proposed renovation until the City can show cause. Union Square Community Coalition v. New York City Department of Parks and Recreation, Index No. 105578/08 (N.Y.Cty.Sup.Ct. April 23, 2001) (Reed W. Super, Albert K. Butzel, for Coalition; Michael A. Cardozo, Ramin Pejan, for City).